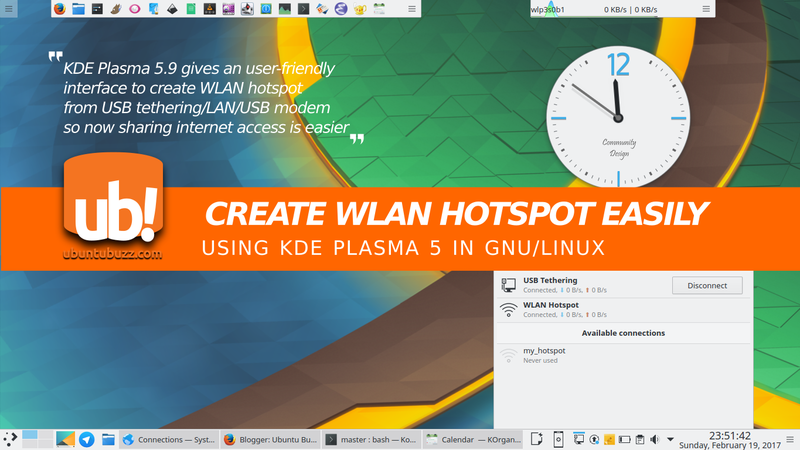 With KDE Plasma 5, you can easily share your internet connection from LAN/USB tethering/USB modem as WLAN hotspot to another computers. Plasma Desktop gives a good GUI to set it up quickly without Terminal. You even don't need hostapd to do this. 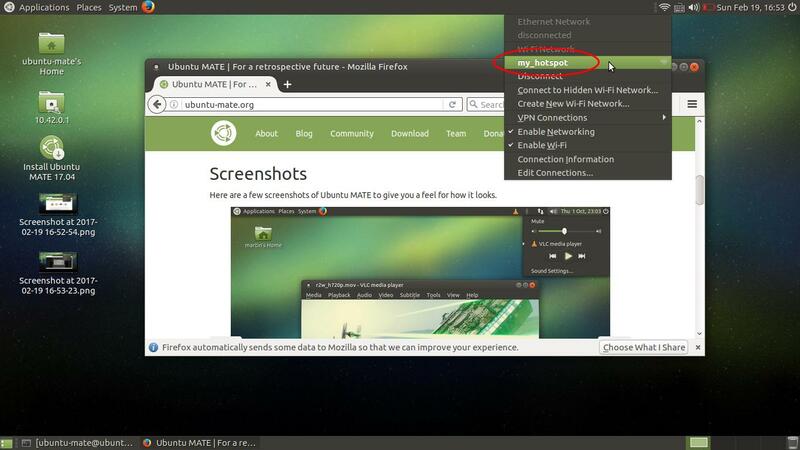 This tutorial is not limited to Ubuntu, so any GNU/Linux distro with Plasma 5 can do it. Here I use my USB tethering as source, a first laptop as hotspot (Neon & Plasma 5.9), and a second laptop as client. If you have similar devices, you can do this at home. If you have an internet access from a LAN cable or USB modem, you can use it as the source, it's just the same as USB tethering here. Connect your smartphone to the KDE laptop > enable its USB tethering > make sure the KDE laptop connected to the internet. 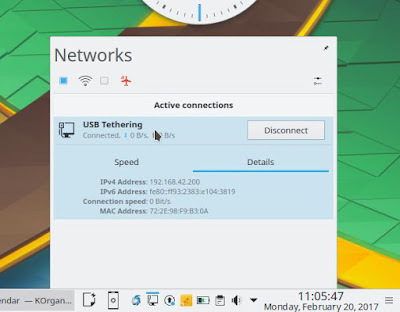 Open KDE System Settings > Networks > Connections > press "+" (PLUS) button > select "WIFI (Shared)" > press "Create" > name the "Connection name:" e.g. WLAN Hotspot (seen on hotspot laptop) > name the "SSID" e.g. my_hotspot (seen on client laptop) > OK. 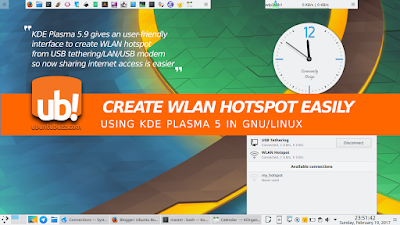 In KDE Plasma, click network icon on panel > connect to "WLAN Hotspot" (the connection name you have determined) > leave the "my_hotspot" (the SSID you have determined) untouched. In client laptop, for any operating system, just find out the WLAN hotspot name ("my_hotspot") and connect to it. Now you can browse the internet on the client laptop. You can also connect any other device to it. You may share your internet to any number of client laptops/computers/devices. You may limit user access by giving your hotspot a password. You can transfer files (via SFTP protocol) between computers connected via the hotspot. You may configure a captive portal if you want to create e.g. 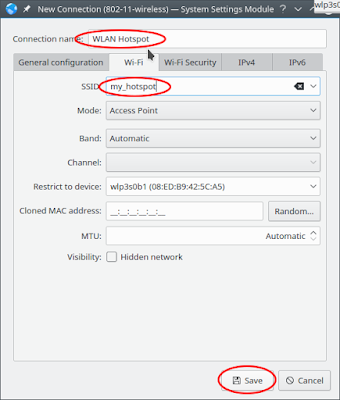 a paid public hotspot using Chilispot (advanced). And there is even a GNU/Linux distro designed to be an instant captive portal called EasyHotspot.